Talking to reporters in Bihar's Begusarai district, the senior BJP leader said such statements could divide the country. Union minister Giriraj Singh today sought an apology from Congress president Rahul Gandhi for party lawmaker Shashi Tharoor's remark that India would become a "Hindu Pakistan" if the BJP returned to power after the 2019 Lok Sabha polls. "(Rahul) Gandhi should also apologise to the nation for the utterance which will only divide the country. (Shashi) Tharoor is an intellectual, a big name, and has been a Union minister. I would like to ask Rahul Gandhi whether he agrees with what his party MP has said," Mr Singh said. Mr Singh also alleged that Mr Gandhi was "adept at changing colours. He could attend a beef party in Kerala and wear a sacred thread in Gujarat". He likened former Vice-President Mr Hamid Ansari's statement that every community had the right to practise its own law to the ideology of Pakistan founder Mr Muhammad Ali Jinnah. However, the Union minister of state for micro, small and medium enterprises did not elaborate on his remark. Mr Singh's remarks were rubbished by the Lalu Yadav's party - RJD - which is an ally of the Congress in the state. 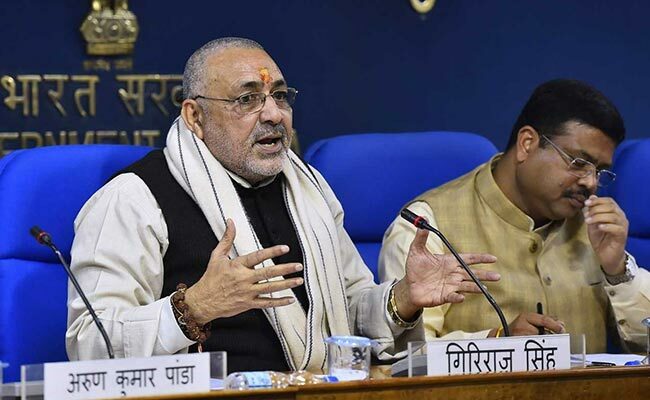 "Is Giriraj Singh not aware that many leaders of his party's allies in various states eat beef. He should stay within his limits while targeting a leader of (Rahul) Gandhi's stature," RJD national vice-president Mr Raghuvansh Prasad Singh told reporters in Patna. "What happened to (Prime Minister) Modi's tall claims of development? His 56-inch-chest notwithstanding, jawans are losing their lives on the border. Nobody knows when black money will be brought back. Farmers are committing suicide on a regular basis, even as the government speaks of doubling their incomes," he said.